Large, highly technical translation and localization initiatives can be daunting. Especially when they are spread out over multiple projects and involve numerous languages. Languages can be ambiguous. Particularly, given the product-, company- or industry-specific terminology that exists and the multiple meanings a term or phrase may have. How do you manage multiple projects with multiple translation and localization experts across multiple languages while maintaining quality and consistency? 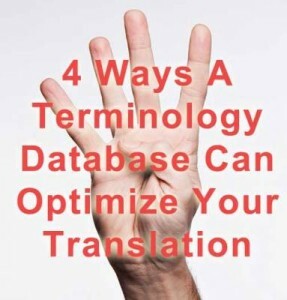 Applying a terminology database helps you achieve quality translations that are both consistent and efficient. A terminology database, also referred to as a glossary, termbase or lexicon, is a centralized compilation of company, industry-specific or technical terms. It serves as a guide to translation and localization experts on how to manage key terminology. A good terminology database will have source language key terms and approved target language translations, along with a clear definition and proper context for its usage. Key terms may include acronyms, names, titles or very subject-specific terminology or information. It may also include specific terms or phrases that are not to be translated, but are to be kept in their source language. A terminology database is part of a suite of translation tools your language service provider should offer, and is best used when there is an abundance of specialized content. Having a terminology database makes translations go smoothly by eliminating the need for translators to spend time researching terminology. A terminology database allows translators and localization experts to quickly and efficiently find the correct translation of key terms, saving valuable time. When translation and localization projects involve a lot of highly specialized content that must be understood equivalently across multiple languages and locations, a terminology database can be helpful by guiding linguists in how to approach key terminology. Since the terminology database makes recommendations to the linguists each time key terms or phrases appear, this speeds the overall translation time and reduces the final costs of the project. Over time, a terminology database also reduces costs and turnaround times for all subsequent translations and localizations for which it applies. A terminology database is a valuable tool for effectively managing client-specific terms in both source and target languages. It provides a unified approach to managing terminology for multiple projects across multiple languages. The terminology database is available to all linguists to use throughout the project and gives a standardized translation for key terms, which guarantees consistency across all languages and iterations of a particular term or phrase. Translations are subjective due to the very nature of language. A terminology database eliminates ambiguity and ensures that important terms are translated accurately and consistently every time they are used, improving the overall translation quality of your language projects. Have you ever used a terminology database or glossary for your translation or localization projects? What were the costs and benefits? Please share your thoughts in our comments section. Also, please use the social buttons above to share this blog with others you think will benefit from it.